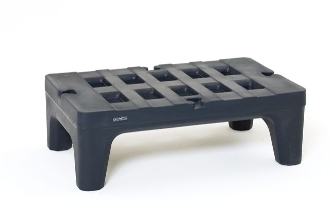 Olympic Dunnage Racks feature one-piece polyethylene construction. Slots run front to back for easy loading and unloading. They are NSF listed and are available in (2) sizes. Color: Charcoal Gray. For products specification sheet OLY-004E. J36PD, 22"w x 36"l x 12"h (550x910x305mm), Weight Capacity: 1200 lbs. (544kg). J48PD, 22"w x 48"l x 12"h, (550x1220x305mm), Weight Capacity: 2000 lbs. (907kg).